We've known that Forza Motorsport 4, when it releases later this year, will support Kinect as a control method. A marketing survey now hints at what some of those features might be, such as head tracking to move the game's camera, and a casual mode that allows players to steer with their hands, similar to last year's Joy Ride. The survey, sent to Kotaku by an anonymous tipster, asked respondents' reactions to certain statements of up coming features. "By using Kinect for Xbox 360, racing fans can now use head tracking to peer into a corner or their voice to control the game menus and interface," read one. "For more casual players you can enjoy sitting or standing controller free and racing alongside your friends, simply by holding your hands at 10 and 2." For more serious drivers, the survey claimed Forza 4 would be the "best looking game of the year with graphic fidelity 10 times better than the previous version, including new lighting and shading models." A new career mode involves "an automotive world tour," promising to "increase the variety of challenges and events you participate in." A new no-assist expert mode was also mentioned, as well as more than 500 cars from 80 different manufacturers. 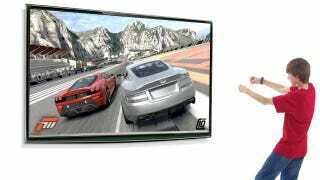 Kinect would also be used to navigate a virtual showroom and learn about the features of the cars in it, with narration provided by Top Gear's Jeremy Clarkson. "Each car will be like its own mini level and after your tour, you can take it out on the track." The survey, in what appeared to sound out what people might want from a Forza 5, also asked respondents to rate their interest in an open-world Forza Motorsport game, which allows drivers to go anywhere on the open road, as opposed to closed-circuit racing. Kotaku has contacted a Microsoft representative to ask if any of these features can be confirmed in the new game or eliminated from it. Any reply will be updated here. Turn 10 is always exploring new ideas and concepts to push the racing genre forward in innovative ways. While we have fielded a few surveys to gauge consumer interest in different features for future versions of "Forza Motorsport," nothing that has been reported is necessarily going to make it into any future version. We will have more to share on "Forza Motorsport 4" soon.